Considering Snow& Ice Melting Technology – Senergy Mechanical Inc. If you are looking for an easy way to clear driveways, walkways, stairs and other critical access areas quickly and efficiently after a snowfall, perhaps you might consider installing a snow and ice melting system. Although it may seem like a new technology, snow melting systems have actually been around for about 30 years, and have been used in commercial and residential applications for more than half a century. 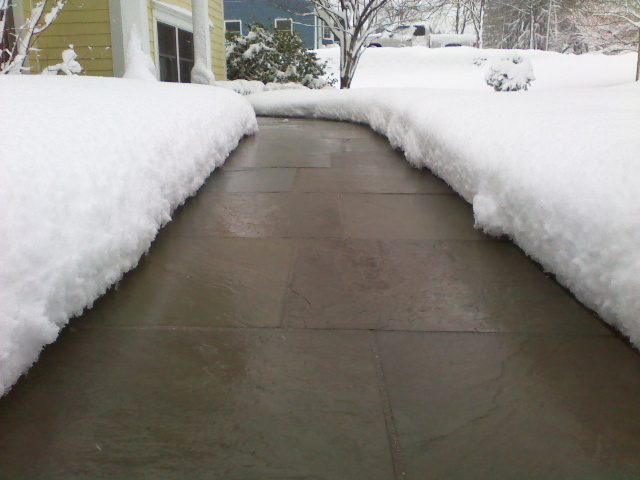 One advantage of using a snow melting system is that concrete driveways and exterior surfaces stay safer. These systems also eliminate the time and labour of using a snow removal contractor to plow and shovel paved surfaces and other access areas. No corrosive de-icers or chemical applications are required thus preserving the life of the underlying pavement. And the snow melting system can be designed to shut off when the snow is cleared and the precipitation ends. These systems are designed based on the needs of the development and most companies will work with an architect or designer to decide what works best. Conductive concrete is doubly helpful with walkways and stairs, since it can eliminate snow and ice buildup as a storm intensifies and continues. No longer do association members or staff have to wait until a storm stops to clear paths. A board’s interest in safeguarding against slips and falls isn’t just out of concern for their residents’ well-being; if a snowy walkway or icy steps causes a serious injury, costly lawsuits could occur. Thanks for mentioning that an advantage of a snow melting system is that no corrosive de-icers or chemical applications are required. I have a co-worker who is very sensitive to chemical applications, so getting a method of ice melting that doesn’t require that would be perfect. Before we start getting snow, I’ll let my boss know about he advantages of getting a commercial ice melting heater.